Our home which was the hosting site for gag.com fell victim to a forest fire which began on 11 June 2013. Our house was very close to where the fire started, so we had no real warning and feel very lucky to have escaped with our lives, our pets, and a few of our most precious possessions. This was the second really significant forest fire in the Colorado Springs area in less than one year, and is the worst fire in Colorado history in terms of structure loss... the count of destroyed homes is over 500. Our property is on an edge of the burn area, so while we lost the house, greenhouse, and one of our sheds... our other shed and many of our trees survived. So we quickly decided to re-build on the same property, and hoped a new house would be ready by late summer 2014. In the meantime, we leased a 2-bedroom apartment in nearby Colorado Springs. We slept for the first time in our wonderful new house on 27 September 2014. If you want to hear more about our experience, feel free to view the video of Bdale's talk at Linux Conf Australia about the fire and some of the lessons we learned. For those of you who asked how you could help us restore and rebuild, thank you. We put together several wishlists and a registries of items we needed to get started in the apartment, all of which were quickly and completely filled. We are extremely grateful to have so many kind and generous friends both in the Colorado Springs area, and all over the world! 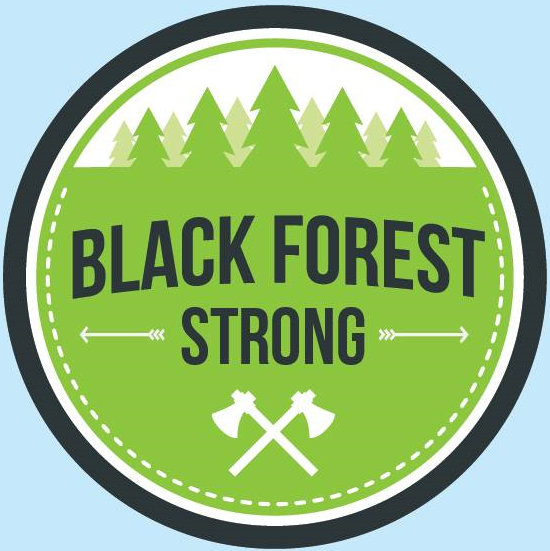 Many of the others in Black Forest who lost homes actually need help much more than we do. The Pikes Peak Community Foundation established an emergency relief fund that specifically benefits victims of this fire. If you'd rather send money to help us rebuild, PayPal transfers to bdale@gag.com may be the easiest way to do that. Black Forest Fire/Rescue, the department that serves us directly and were likely first on the scene. Wescott Fire Protection District, an adjacent district whose personnel were fighting the fire literally along the edges of our driveway when we tried to drive out, and who ended up walking us out through the already-burned area to safety. Falcon Fire Protection District, whose members showed us immense generosity in the days following the fire. Finished cleaning up the apartment and associated garages, and turned in those keys. Began to move out of the apartment and in to our new house! We're home! Our builder passed his final inspection with regional building! A list of final (mostly cosmetic) details to finish up, then we can move in. Hardwood floors are in, tile floors are in process, finish electrical has started, trim material in the process of being stained. Rough-in inspections for plumbing, electrical, HVAC, and so forth all completed... on to insulation! Exterior doors and windows in, roofing begun, duct work underway. Concrete slabs for basement and garage floor poured. Concrete poured for the foundation / basement walls. Concrete poured for the foundation footers. While visiting the site for other reasons, Bdale observed that Mountain View Electric has installed a new transformer, riser, and meter base on the last electric pole on our property. After some iteration between the architect and engineers, we now have a complete working plan set with engineering stamps on the way to Regional for issuance of building permits. Got our "last" set of questions answered by our contractor, and signed the contract for constuction of our new house. Met with contractor to review cost estimates for our revised plan. We're within budget now, so gave him the go-ahead to write up a contract! Met with contractor and architect to deliver our proposed updates to the plan and discuss. We're actually happier with the revised design, they both seem to like what we proposed, and everyone is optimistic it will come in within budget. Met with our contractor to discuss costs. Not too surprisingly in hindsight, what we designed would cost more to build than we are prepared to spend. Back to the drawing board, literally! Met with our contractor to provide information he needs to put cost estimates together for us in parallel with waiting for structural engineering work to be completed. After several iterations, we now have floor plans and elevations that accurately represent what we'd like to build. First draft of main floor plan received from the architect we're working with. Demoliton work completed. The remains of our house, shed, and greenhouse are now gone. The remains of the two cars that burned were removed from our property and sold as scrap metal. After a week spent interviewing contractors who might help us build a new house, we made a decision! We'll be working with Doug Strecker, dba Rampart Custom Homes. At his suggestion, we'll be using David Woody as the architect tasked with turning our sketches into working plans. Signed lease on 2-bedroom apartment in Colorado Springs. We're not sure who created the original artwork, but thanks to Eric and the gang at Black Forest Automotive for the cool bfs.png!